If you’re a beginner in a world of crypto, you will probably want to start somewhere near one of the most popular coins — XRP, also known as Ripple. Good choice! 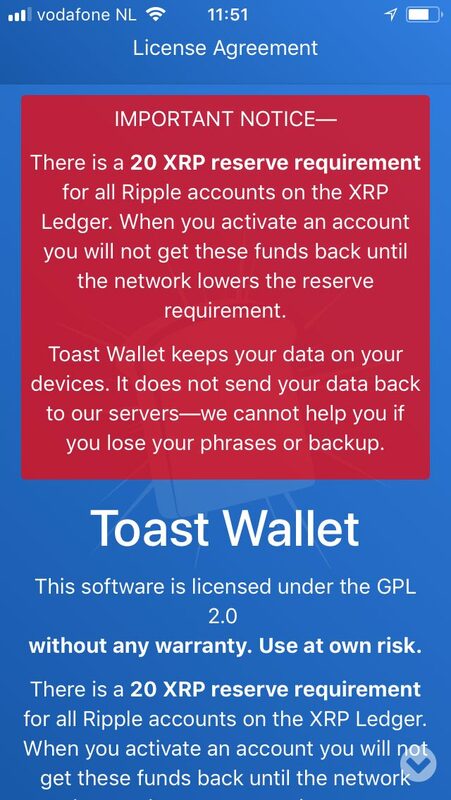 To assist you in that, we’ve created a guide on Toast Wallet!, a popular XRP client, “simple enough for your grandma but safe enough for a Swiss banker”. AirdropAlert has already reported on cold storages, the best possible storages to hold your crypto funds. Plus, we’ve covered multiple issues possible with all the hot wallets, aka mobile apps and online clients. And yet, we are opting for a mobile version of Toast Wallet! because it’s easy and has got a good reputation. Besides, it’s fast for the reason that it downloads only a little part of the whole blockchain. Take into account, Ripple doesn’t have an official wallet. All the same, before we proceed to the installation process, you should know that Toast Wallet! has obtained miscellaneous competitors on the web. Abra, Exarpy or Cryptonator, to name just a few. Each of them is a nice suit for a beginner. So you’ve got plenty to choose from. With Toast Wallet!, you’ve got actually two ways to go. You either download a PC/Tablet version or, like us, choose the mobile app. This is the first window that launches when you access the app. What that red notice basically implies is that you can’t use your wallet until you have minimum 20 XRP on your address. But don’t freak out. It’s not about Toast Wallet! This is the XRP thing in general. Take a look at the official announcement of the company. The XRP Ledger applies reserve requirements, in XRP, to protect the shared global ledger from growing excessively large as the result of spam or malicious usage. 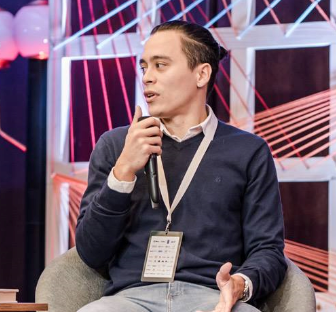 The goal is to constrain the growth of the ledger to match improvements in technology so that a current commodity-level machine can always fit the current ledger in RAM and the full ledger history on disk. 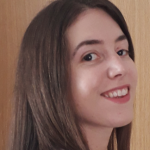 The control question: how many XRP do you want to transfer from your offline storage to your new account, to sell 20 XRP on a crypto exchange? Right, 40. To activate your Toast Wallet! 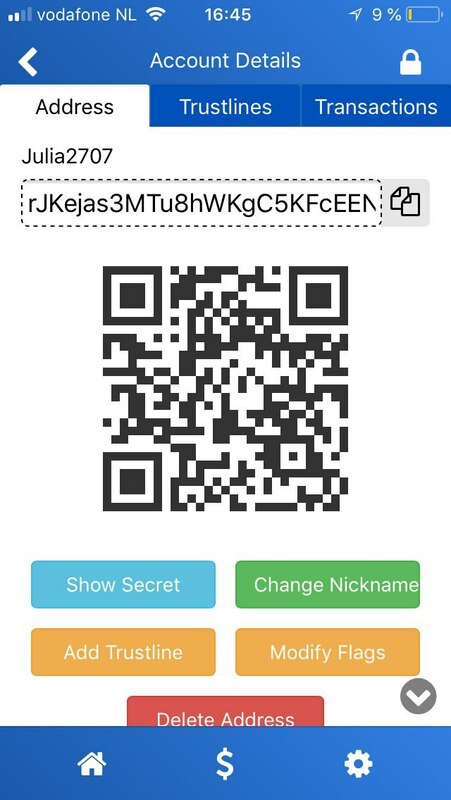 address, send to it 20 XRP. If you don’t want to lose your money, don’t send the amount less than 20 XRP to your new account. A not-yet-activated address results in a failed payment. Here is a quick hint. Do you want to make sure the account has been activated? Use RPC Tool to look up the address you are sending to. If the tool says account not found, then the address hasn’t been activated yet. Let’s start from the red tab. You’re going to need it if you want to, say, transfer some funds to your Toast Wallet! app from your Toast Wallet! software on an offline laptop. Why do you want to do that? Because your funds are safer with the cold storage. 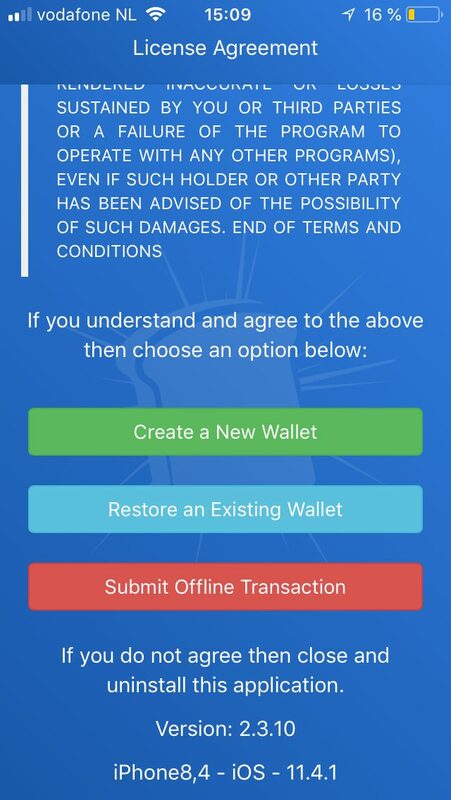 This next blue tab “Restore an existing wallet” you hit if somebody stole your phone and now you want to get the access to the funds. But in our case, you’d rather want to push the green button. To give you the truth, guys really messed up with the terms on their FAQ page. But we’ll try our best to leave you with the feeling of absolute clarity. So this third step is an important step. Set your passphrase, print it out and keep in someplace safe. Why do you need it? For several reasons. First, to send XRP from your account. Second, to recover your Toast Wallet! account if you lost your phone or deinstalled the app. Yes. 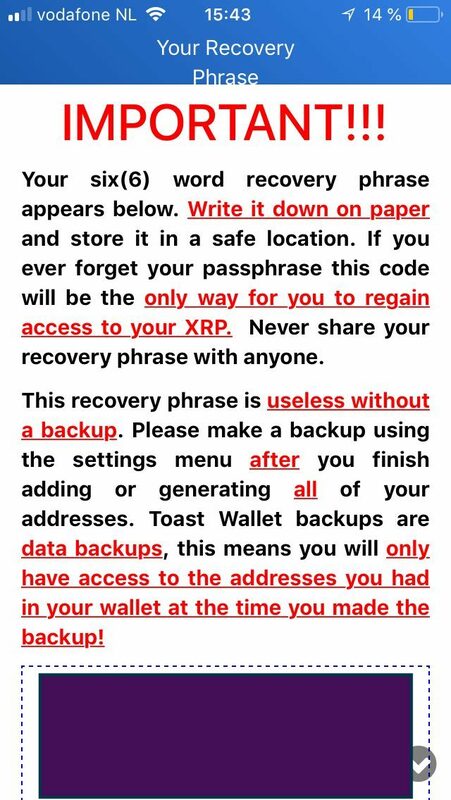 In order to recover your Toast Wallet! 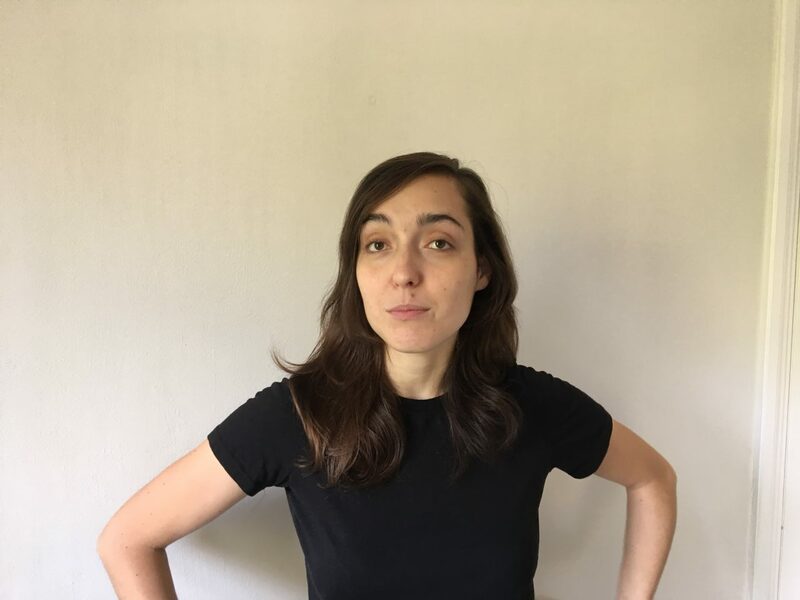 account, you’re going to need the backup code (we’ll talk about it later) plus either this following passphrase or your recovery phrase (the 4th step). We know. This window kind of looks surprisingly unattractive but the phrase we’ve blurred is your recovery phrase mentioned above. 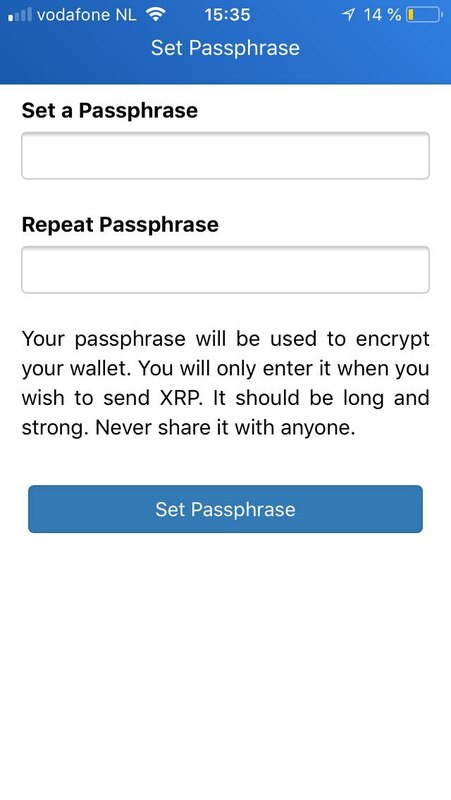 In the future, you might need it together with the backup code, to access the wallet. In case you lost your phone or uninstalled the app. After you have the recovery phrase written down, hit the “+” sign and generate a new address. Why no picture on the 5th step, though? You will totally get it. We promise. There will be only one sign on the whole screen, a “+” sign. …and create your backup. To have a backup is, actually, a very good idea. It will help you keep your funds safe in case you lose your phone or forget your access details. Congrats! 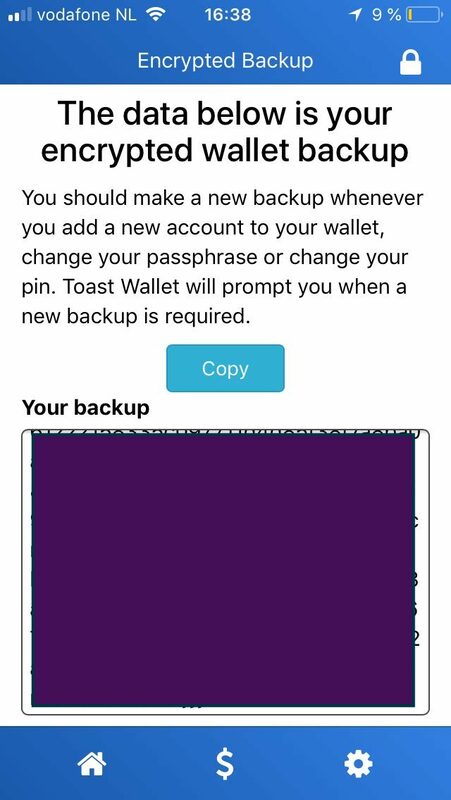 You’ve created your Toast Wallet and even have a backup! 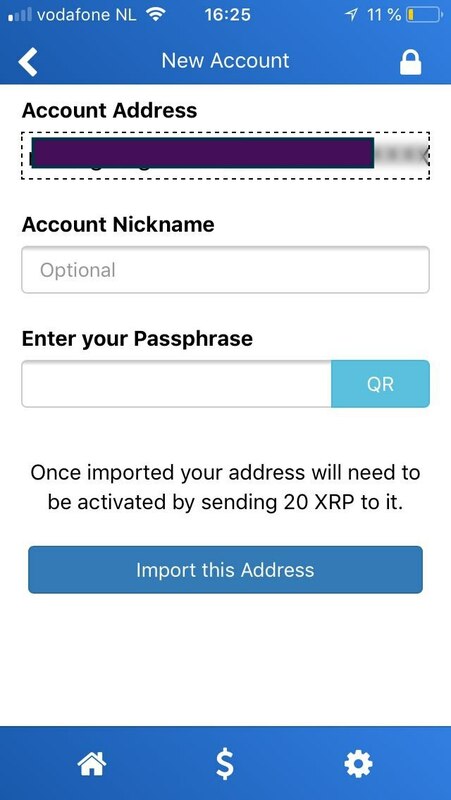 The only thing left to do is activate your account by sending to it 20XRP! This is what your Toast Wallet! address will look like. Go to one of the crypto exchanges, buy 20 XRP at least and send it to your wallet using this address! Note! 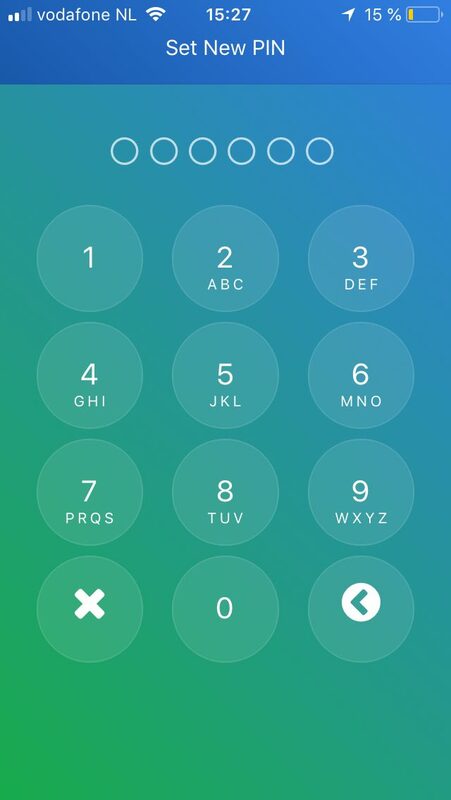 If you send money to a particular address and your app returns an error that means the address has not been activated yet.